The PMW-500 is Sony Professional's first XDCAM HD422 Camcorder with solid state recording. It supports full-HD 422 50-Mbps MXF record and playback based on highly developed MPEG-2 Long GOP compression technology. Uniquely, it can also be switched to record in HD 420 35-Mbps MP4 format which makes for seamless integration when used alongside XDCAM EX models. Its 2/3-inch type three Power HAD FX CCD sensors deliver the same outstanding picture quality and low-light performance as the acclaimed PDW-700, however it records onto Solid State SxS media rather than optical Professional Disc. The exceptionally ergonomic chassis is a development of the acclaimed PDW-700/F800, while already class-leading power consumption is further reduced along with weight for superb on-location usability. Sony's XDCAM product range sets the benchmark for high speed, exceptionally flexible, file-based workflow. XDCAM Professional Disc products were first introduced in 2004, followed by high-speed memory-based XDCAM EX in 2007. A common technology platform provides a unique hybrid workflow meeting a broad variety of customer application needs. Hire the Sony PMW 500 XDCAM from Procam. 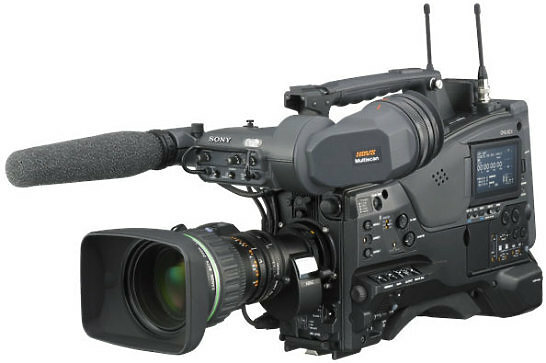 Best service and rental rates for the Sony PMW 500 XDCAM and all cameras, lenses, sound, lighting and grip.